A perfect homemaker, a lovely hostess and a beautiful woman, there was much to learn from Mrs. Neeta Lodha. She also shared with us some of her favourite Rajasthani recipes while we enjoyed a wholesome meal at her Haveli in Ajmer, Rajasthan. 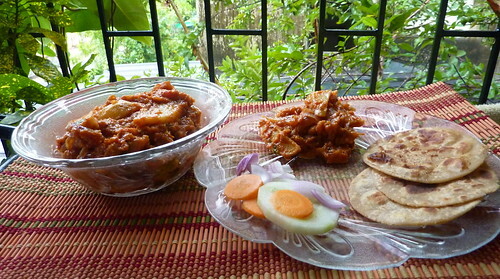 A traditional favourite in the state of Rajasthan, “Aloo pyaaz sabzi with tikkad” is a combination of potatoes and onions with tava roasted rotis – a preparation that is popular during weddings and feasts. 1. Peel and wash the potatoes and ¼ kg onions, slice them into lengthwise bits and set aside. 2. Grind the tomatoes into a fine puree and set aside. 3. Grind the remaining onions and garlic into a fine paste & set aside. 4. Grind the green chillies and ginger into a fine paste & set aside. 5. Heat ghee for deep frying in a pan, add the potatoes & onions, a few at a time, and deep fry until golden. Remove on an absorbent paper and set aside. 6. Heat 3 tbsps ghee in a pan and add the cumin, asafoetida and bay leaves. 7. Add the onion-garlic paste and sauté until the aroma rises and the raw smell disappears. 8. Now add the chillies-ginger paste and the remaining spices and sauté for a few minutes. 10. Add the fried potatoes and onions and cook for a few minutes. 11. Take off flame & garnish with chopped coriander leaves. 1. Mix all the ingredients and knead into a soft dough. Add more milk if necessary. 2. Roll into 6 inches thick rotis & shallow fry on both sides until well done. 3. Serve with the Aloo-Pyaaz subzi. This recipe was first featured in Soul Food and Soul Mates – a column in Harmony Magazine. Part-1 of this post is the interview with Neeta & Sumthimal Lodha from Rajasthan.